Fernando and Julio were fantastic. Arranged for car rental and delivery, contacted a doctor for a house-call. So friendly and helpful. Loved the comfortable sofa in our unit! Good beds, linens, pillows. Greatest beach location in West Bay. Words fall short in describing the experience we both felt in the handling of our stay by the owner's Zoro & Carmella, who made us feel like family instead of guests. They created a home in paradise and we were fortunate to have been allowed to experience their hospitality and enjoy the top of the line amenities that were included. Their space was carved into a hillside overlooking the ocean and no detail was left unfinished in their creation. 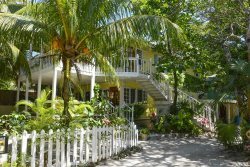 The neighborhood is tight-nit and safe and short walk down to the beach to continue to either West Bay or West End so was advantageous in its location to both. The beach is private with it's own dock to hail a water taxi or swim/snorkel/kayak from. This island getaway is Paradise, yet finding such people whom I list amongst my friends now is priceless..Malto Bene! Response to questions was very prompt and informative all during the booking process. Certainly felt prepared upon arrival with appropriate items like bug spray etc. I would suggest other guest be informed new bills from US banks are preferred in Roatan. Typically stay in all inclusive resorts and decided to try a new location plus new lodging. It was such a great experience to be in a luxury island tree house/casa and to have such fantastic hosts Zoro and Carmela. They were very helpful on how to navigate the island plus educated us on Roatan life. Everyone in the Turtle Beach area was great and extremely helpful in making the trip to Roatan wonderful. I will certainly look forward to another trip to Roatan!! The bonfire on the beach on New Year's Eve will be hard to beat. Zoro and Carmela are 5 star! The management team is knowledgeable and pays attention to detail. They were reliable and great to work with. A great price and location. The facility was as described on the site and was just what we were looking for. Ruth and Fernando are the best! I'll be back in January 2018 sometime. The staff here is very accessible and helpful. This is the second time I've stayed at Ocho Palmas. It exceeded our expectations once again. REPLY: We are happy you enjoyed your stay and hope to have you back soon!